Le Clos Saint-Ambroise - Old MOSELEY tannery. Luxury Condo at the edge of Lachine Canal. Benefit from an open space concept, high ceilings, skylights and a large Terrace with a view. This luxury condo offers a unique cachet with two bedrooms and one full bathroom with exposed brick walls. Garage included with a very large locker. The co-property is well managed with only 27 units distributed on 2 floors in the old MOSELEY tannery. Le Clos St-Ambroise is a unique industrial building completely restored while preserving the industrial feel of the 19th century. - Automatic sprinkler system- 1 Interior parking- 1 large locker in the basement. - Inside courtyard with a small fountain facing the original protected chimney. Presently rented at 2500$/month with a possible agreement with the tenant to leave in March 2019. 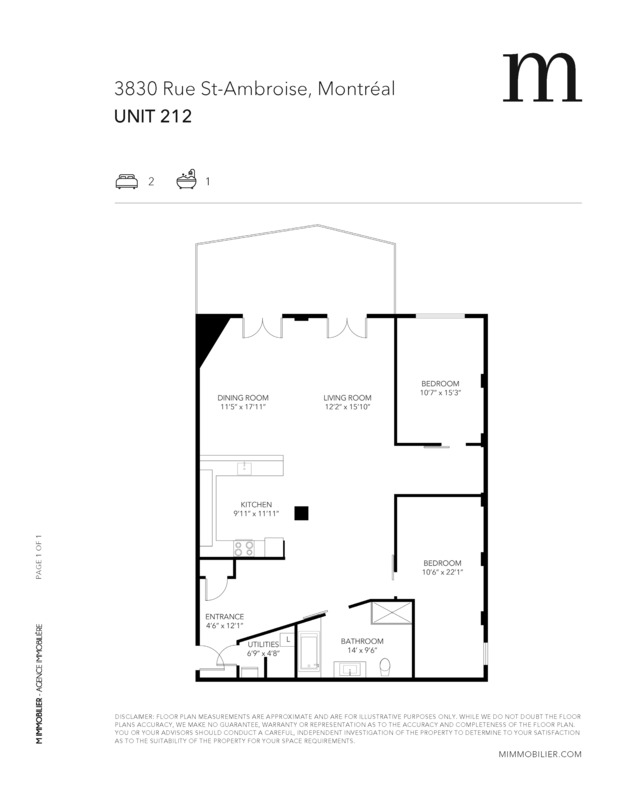 Proximity to downtown, Atwater market, bike paths, Canal Lachine and much more. Book your visit. High-end appliances (Fridge, Viking professional & Kitchen Aid Superba natural gas oven, commercial vent, Kitchen Aid dishwasher, Washer & Drying machine set Panasonic Microwave). All sold without legal warranty. Optional: most furniture could be sold (to be discussed).